Bicycles funded by our Dream Bike campaign have brought joy to ‘Gift’ and children like her in rural Thailand, making it easier for them to maintain a regular education. Gift (left) and friend show off their new bikes distributed through our Dream Bike campaign, in partnership with the Camogie Association. Dublin, February 2nd 2018; Brian Mac Neill – with thanks to Chaweechoke Suphophark, Community Children Foundation (CCF) Thailand. Gift is the name of the little Thai girl in the picture above. Gift is happy! 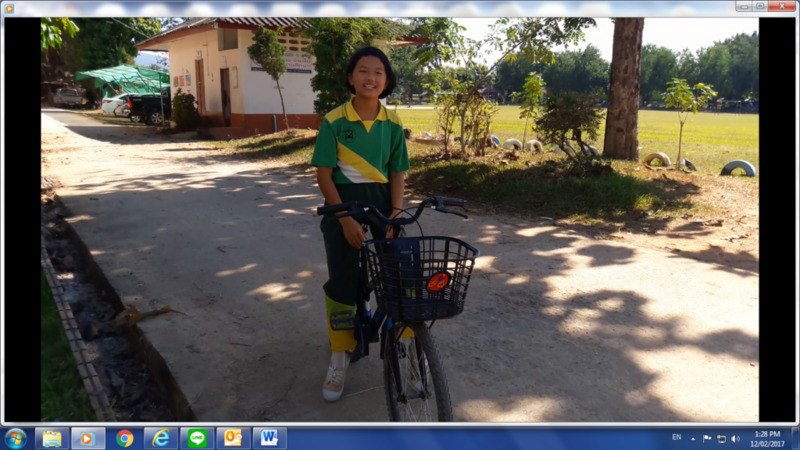 She recently received a new bike which will make it much easier for her to travel to school, and to have fun with her friends in the remote community where she lives. Gift is 9 years old, she’s from Baan Nongwaeng School in the Kon Kan province of Thailand. A difficult family situation has placed Gift in a vulnerable position, which in turn has put her and her family firmly on the radar of ChildFund and our partners on the ground. Identifying particularly vulnerable children like Gift and assisting families to help improve the child’s supportive environment is exactly what our work is all about. Gift’s parents are divorced. She does not belong to her own land. She lives on Thai railway land with her grandmother, mum and younger brother. Her mother is currently employed as construction worker, earning a mere 250 baht (€6) a day. Because of insufficient income they themselves cannot support the family’s expenses. Sometimes her mother is forced to borrow money from the neighbours to make ends meet. its a difficult situation, one in which just ‘getting by’ is the order of the day. Gift always dreamed of having a bike to ride to school on because like many children in the developing world, her school resides a long way away from her home. As a result she frequently arrives late to school, disrupting her education. 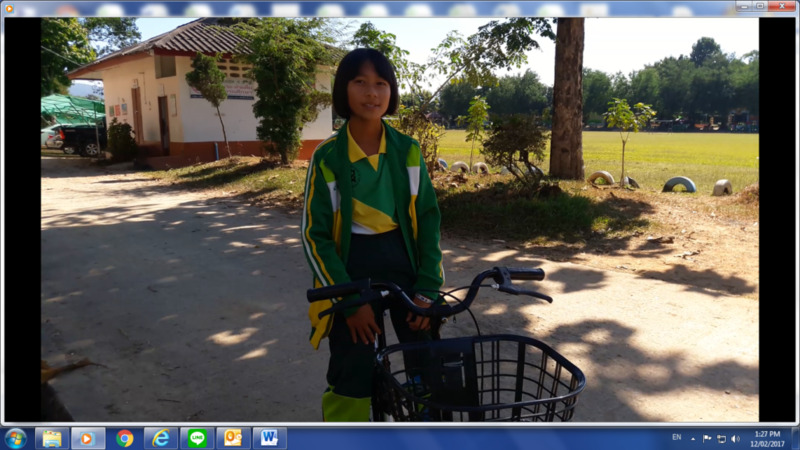 It was not possible for Gift’s mother to buy her a bike but now thanks to our Dream Bike campaign, funded through the generous support of Irish donors , Gift has the means to get to school regularly and to prioritise her education. At the weekends there is time for Gift to do what she loves most, riding around on her bike with friends and having fun. 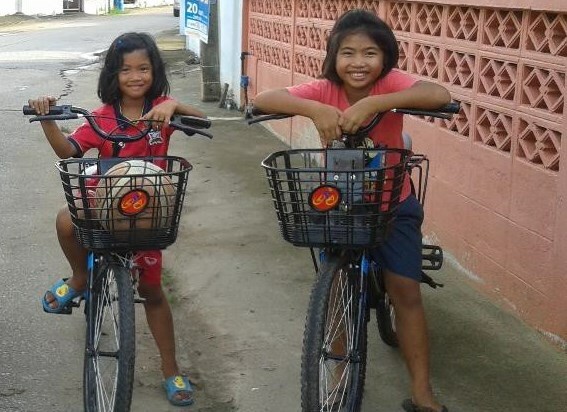 Gift was just one of 136 children from Thailand to receive bikes as part of the Dream Bike initiative, in 2017. Children in rural areas of Thailand often have to walk long distances of 3 kilometres or more, to commute between home and school each day. That’s a lot of accumulated walking for little legs to manage in a tropical, humid climate. Its an exhausting daily grind. In such circumstances it is perhaps inevitable that Children suffer from fatigue and tiredness, finding it difficult to maintain regular schooling and thus jeopardising their educational progression. Education is a vital cog in helping to break the cycle of poverty that blights lives of children like Gift, in disadvantaged communities across the developing world. The rainy season in Thailand brings further hardship for children who may be struggling to maintain their education, often forcing them to slog through mud and making the commute to school longer and even more difficult. For children who have to face such long daily commutes throughout the year, the gift of a bike can seem like a dream come true. Such a modest thing to people to many people around the world can mean everything to those who have so little. On behalf of ChildFund Ireland and our charity partner the Camogie Association, we would like to thank all those who have generously supported this fantastic campaign, thus far. We are delighted to share with you this update from Thailand and demonstrate the kind of joy, hope and positive energy that your generosity can inspire. Thank you for helping to make these children’s dreams come true. For those who have not yet supported the campaign but would like to do so, please visit our dedicated DREAM BIKE landing page for more information. Finally, A sincere thanks to our colleagues at CCF in Thailand for coordinating this distribution of these 136 bikes to disadvantaged children in 3 provinces of the country; Khon Kaen (53), Nakhon Phanom (30), and Payao (53).